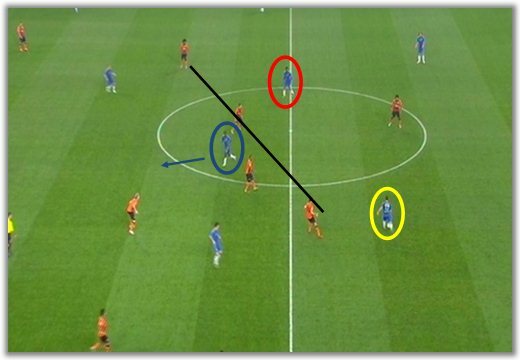 Combination Play: Attacking coverage - what is it exactly? 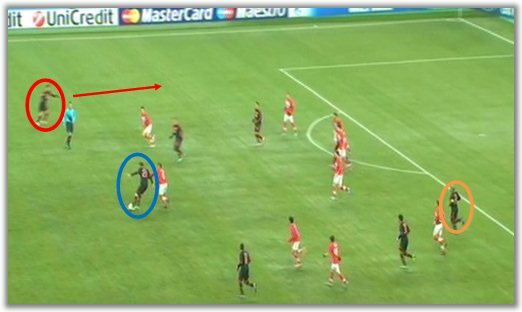 Basically this means that there must be one or more players beside and/or behind the player with the ball in order to help keep possession, but also to make sure that, if the ball is lost, there is someone ready to contain the initial threat and stop opponents from breaking quickly. 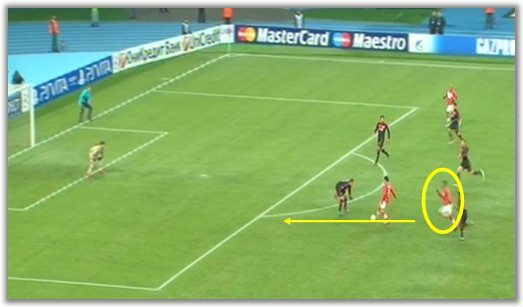 While both these cases can also be ascribed to poor individual decision making, this article will focus primarily on the attacking coverage and how important it is for the player with the ball to read the game and understand what the best option may be. The play starts on the right. Hazard (yellow) has dropped back and gets a pass from Terry. Trying open up a space for his team-mate, Ramires (blue) moves forward. The ball will be played to Mikel (red). Notice how the four Shakhtar players form an almost perfect diagonal, restricting passing options. Mikel gets the ball and, instead of passing it onto David Luiz (orange) or Ivanovic (green), he returns to the middle of the field. Ramires (blue) moves back, trying to provide support for his team-mate. 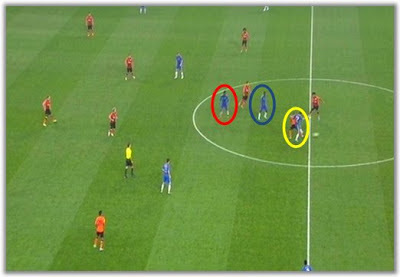 Mikel, under heavy pressure, eventually dispatches the ball to Hazard, but both Mikel (red) and Ramires (blue) are higher up than the Belgian. Cole can be seen on the halfway line and Ivanovic (please see next picture) is further up. This means that there is only Terry and Luiz behind Chelsea's wunderkind. 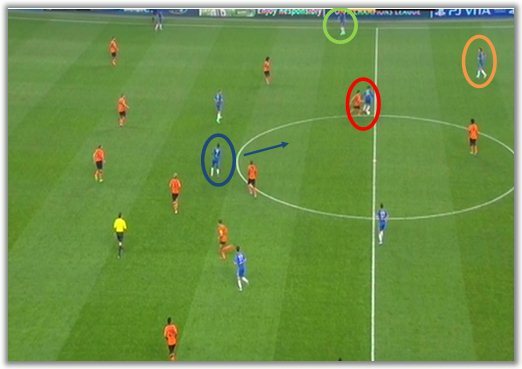 Hazard gives the ball away and now there is a 2v2 situation, with Ivanovic (green) too high up. 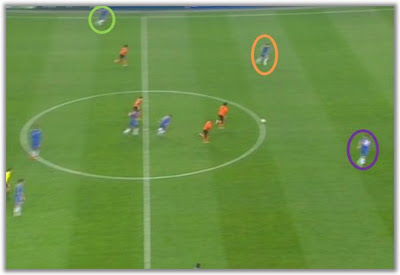 With Luiz (orange) wide open, Terry (purple) correctly tries to delay the play. Luiz (orange) runs diagonally towards the centre, while Terry (purple) continues in the centre, waiting for backup. This is when Terry takes a dreadful defensive approach. With Luiz now closer to his man, Terry gets closer to the man with the ball, opening a huge boulevard for the pass behind him, instead of restricting the passing option. Good game-reading skills are essential anywhere, but in such a stringent context as the Champions League, one mistake is often what it takes to get punished by the other team. Without proper attacking coverage (i.e. safe passing options), both Mikel and Hazard should have realised the danger and played it safe. On the other hand, their team-mates should have provided better support while attacking and adapted accordingly as soon as they started guessing the ball might be lost. 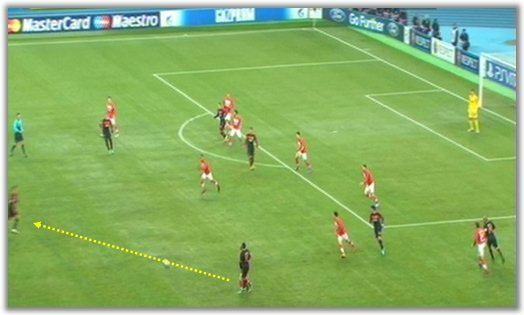 In this particular case, Benfica are, as usual, attacking down the right. Salvio (the right winger) passes the ball to Matic (the team's holding midfielder). Matic (blue) is immediately pressured by Rafael Carioca (the eventual goalscorer). Benfica right-back Maxi Pereira (orange) is currently the team's most advanced player. The left-back Melgarejo (red) notices his team-mate in difficulties and still pushes forward, rather than offering a safe passing option. 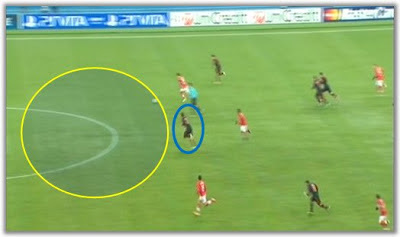 Notice how many players Benfica have in front of the ball. In a poor decision, Matic tries to get the ball to Melgarejo, only to see it intercepted by Bilyaletdinov. The shaded area indicates how there is no one behind Matic (blue) besides the centre-backs, in their own half. In this picture, it's easy to see that there are as many defenders as there are attackers. Jardel (purple), a bit like Terry, worries too much about the ball and forgets to occupy or restrict the passing option. The ball would get to the unmarked Jurado. Jurado holds the ball up, waiting for a team-mate. Rafael Carioca, who had initially put Matic under pressure, speeds past his and Jurado's markers and puts the ball in the back of the net. This was another prime example of the need to read the game according to the player's positioning and the team's. While it's true Matic's pass was less than stellar, one mustn't forget the numerous bad decisions from his team-mates, not offering enough safe passing options - including one of them even pushing up after seeing his holding midfielder in trouble. If Matic had been properly supported, there would have been a couple of passing options beside or behind him, in order to both keep possession and avoid a fast breakaway if the team lost the ball, as they did.